You will find real cinnamon throughout the cupcake. Swirled inside the cupcake itself and generously mixed into the buttercream frosting. 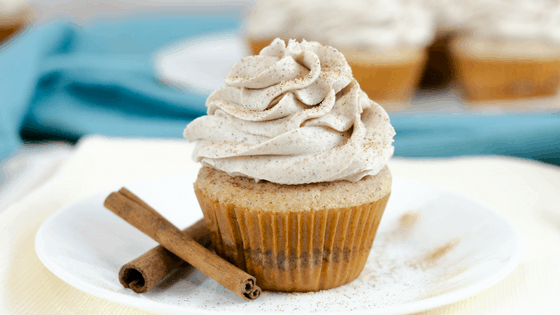 By adding a light dusting of cinnamon on top of these cupcakes, it gives it a beautiful finishing touch. Cinnamon can be tricky – sometimes you can add just too much and it’s overwhelming. Certainly, this is not the case with this recipe. Although it has the cinnamon spice throughout the cupcake, it is more subtle than overpowering. Also, making and baking these cupcakes with awaken your senses with the enticing scent of vanilla throughout your home. I believe that making a cupcake shouldn’t be difficult. A cupcake can easily be made by baking a vanilla cupcake and frosting it with buttercream. Well, that’s how simple this recipe is! It’s an extra step for the cinnamon – it’s as simple as that. These cupcakes don’t take a lot of work but they succeed in elevating your everyday cupcake. No one will even know how little work it took to make them. 😉 Additionally, they’re a lot of fun to make and they definitely spark creativity. My mother requests these Vanilla Cinnamon Sugar Swirl cupcakes for her birthday every year. In fact, she doesn’t even have to ask, she just expects them. They’re a real treat for friends and loved ones, they’ll love them so much they’ll request them time after time! Follow me on Facebook and Pinterest to stay up to date on my new and upcoming recipes! This article may affiliate links. If you purchase products through these links I may earn a small commission, it is no extra cost to you and it is means to help support this blog. A vanilla and cinnamon base cupcake with a vanilla and cinnamon buttercream frosting. Mix together flour, cinnamon, sugar, baking soda, and baking powder in mixing bowl. I use my electric mixer. Add butter (room temperature), egg whites, sour cream, vanilla, and milk - Mix until smooth (no lumps). Sprinkle 1/4 tsp of cinnamon sugar mixture on top of cupcake batter. Repeat steps until liners are half way full. Remove cupcakes and continue cooling on wire rack. Mix room temperature butter and shortening until smooth. Mix in cinnamon until well blended. Add in milk 1 tbsp at a time. Add until right consistency. Sprinkle with cinnamon sugar if desired. Wait until cupcakes are completely cool before frosting. This recipe is easily doubled and the frosting recipe is great on other cupcake batters as well! Tip: If you want cupcakes with tall frosting, prepare 2 batches of frosting. Like this recipe? Check out my Caramel Drizzled Brown Sugar Vanilla Cupcakes! This looks so yummy. I must have to try it. Thank you for sharing it. ooo these look so good! Penzey’s makes a great vanilla sugar that I bet would be great in this recipe too! I have half of these ingredients in my kitchen already. I know what I’ll be making for dessert this weekend! ooo these look and sound so good! My siblings and I are filling this week with baking and I think this is definitely something to add to our list! My mouth is watering just looking at these! Not only that, but your icing skills are on point! Thanks so much for sharing this yummy recipe! This girl wants those cupcakes. I will definitely try the recipe as soon as possible. Make a dozen cupcakes. Eat a dozen cupcakes. I enjoyed looking but best not make them! These look like a dreamy little treat! I love vanilla and cinnamon together! I love cinnamon anything and these cupcakes look absolutely delicious! Perfect for brunch too! What delicious looking cupcakes – big cinnamon fan so these would go down a treat in my house! This is definitely my kind of cupcake recipe! Loving that added cinnamon and vanilla… yum! I really love all desserts with cinnamon, so these sound just perfect! These cupcakes look delicious. Cinnamon and Vanilla are two of my favorite flavors and I’m sure they taste amazing mixed together! I love cinnamon. These sound amazing! Yum! These cupcakes look absolutely delicious! Saving this recipe for later! I want to try this and I have everything needed besides the sour cream. Is there a substitution that would work?